“The glowing references supporting your outstanding advocacy and courtesy, compassion and expertise are inspiring and a real tribute to you and the bar. Very well done and keep up the fantastic work.” Chantal-Aimée Doerries QC, Chairman of the Bar. Elizabeth is a specialist Family Law Practitioner and Advocate. Elizabeth was called to the Bar in 1998 but actually began her career in Family Law in 1987 when she commenced employment with North Yorkshire County Council as a Legal Assistant in the Child Care Department. Elizabeth has therefore over 24 years of experience in family law advocacy. During her time at the Bar, Elizabeth has been instructed on extremely complex cases and she has regularly appeared in cases in the County Court and High Court that have included issues of severe sexual abuse, severe physical abuse, fictitious illness, poisoning, death of a child, murder of a parent. She regularly appears in cases, and has to call and/or cross-examine medical witnesses and experts, including pathologists, paediatricians and radiologists. In 2010/2011, Elizabeth was led by Leading Counsel in 4 different public law cases that involved significant and complex issues of medical evidence, disclosure, abuse of process and capacity. Elizabeth represents a wide range of clients including local authorities, parents, grandparents, Guardians and the Official Solicitor. 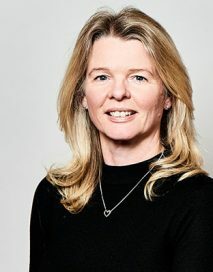 Elizabeth has also been regularly instructed on behalf of privately paying clients in private law disputes involving contact, residence, change of surname, change of school and move from the jurisdiction. In view of her extensive Local Authority experience, Elizabeth has also been instructed to advise local authorities on aspects of their public law responsibilities, including judicial review and compliance with internal policies and statutory regulations. Having gained considerable experience in dealing with vulnerable clients, particularly those who are enduring distressing and stressful personal circumstances and have communication difficulties, Elizabeth welcomes instructions in cases involving Forced Marriages and Court of Protection. Elizabeth also has experience of presenting and defending cases in the Employment Tribunal. Re R  EWCA Civ 1638 : led by QC on successful appeal brought by local authority. Re R (2000) : led by QC and represented new partner of mother who had been convicted of the manslaughter of a previous girlfriend. He had stabbed her numerous times. The local authority in this case conducted a fact finding hearing on those historic events in order to protect the children of the new relationship. Re B and C (2010) : led by QC and representing very young father who was alleged to have inflicted severe injuries upon his infant daughter. The Official Solicitor was invited to act in this case in view of the father’s age, maturity and understanding. The case involved a number of preliminary hearings that focused upon the father’s capacity and ability to give evidence at the fact finding. The case also involved numerous medical experts from a range of different disciplines. Re B and T (2010) : led by QC and representing a mother who was alleged to have killed one young baby and separately to have tampered with the feeding and medication lines of his surviving twin whilst that child was in hospital. Both twins were born with serious heart problems. The case involved numerous medical experts from different medical expertise. The case was listed for a 6 week hearing and involved evidence from 40 witnesses. Re L and B (2010/2011) : led by QC and representing mother who some years previously had administered Tramadol to her child whilst the child was in hospital and being investigated for feeding problems. The child also had a history of being presented by the mother with blood in her stools, urine and nappies. The case was listed for a 10 day finding of fact hearing to determine numerous allegations including fabricated and/or induced illness. The case also involved a contested hearing upon abuse of process arguments. Re T (2010/2011) : instructed by the local authority in a complex case involving allegations of sexual abuse. The allegations were made by 4 young children and were made against a father, a mother, an uncle, older step siblings and a family friend. In view of the range of allegations and potential perpetrators the case had numerous interlocutory hearings involving issues of disclosure and party status before being listed for a 10 day hearing.